The Kumbh Mela, which goes on 24 hours a day, is intense only in the measure it is received by each participant. You simply cannot escape yourself. And while this may seem difficult at times (and it was for me), it is also filled with moments of supreme inner freedom illuminated by divine love, all under the eternal Grace of Sai Maa. This makes it one of the ultimate spiritual experiences. What is common to each participant is what is outside of themselves… the camp, the amenities, the sounds and sights and smells throughout the day and night, walking with the group (which on certain days would be in the millions) to the confluence of the river Ganga, the river Yamuna, and the underground river Saraswati for the ritual communal bath, and receiving daily darshan from Sai Maa. Why is the site of the Kumbh Mela significant to your experience? All of the higher energies of the natural and etheric worlds descend here on a periodic basis. The Kumbh Mela dates are set to align with these higher states, these higher planes. 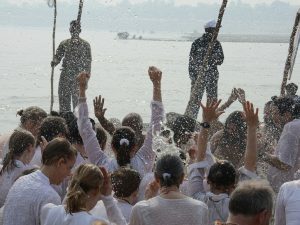 The exact dates of the baths, as is the case at each Kumbh Mela, are established to align with the energies and higher frequency patterns of the cosmos. This provides a significant boost, ‘a leg up’ so to say, for all of your dreams and desires, known and unknown. The many, many acres that make up the Kumbh Mela campgrounds are divided into a grid. Streets run east-west and north-south. There are hundreds of sites. 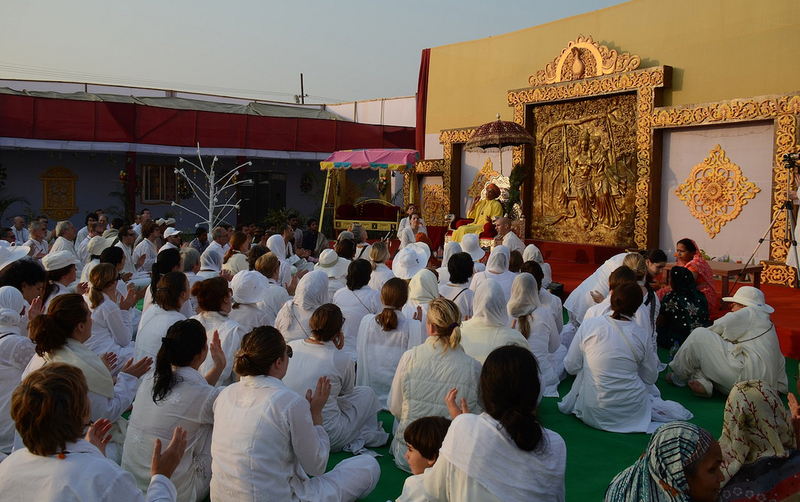 The camp of Sai Maa is significant in its grandeur and its amenities. You may expect this level of attention and high standard from Sai Maa, and you will not be disappointed. What is the daily routine at the camp? The early morning rituals, that include group meditation, are fairly standard. Everyone takes meals together as community members serve you delicious and fresh, warm food. Adjoining the participants dining area is a vast dining hall that will serve food for much of the day to hundreds of pilgrims who are fed as much food as they desire. Over the course of the 5 weeks of the Kumbh Mela, thousands of pilgrims will be served free meals at Sai Maa’s camp. A focal point of the camp is the Darshan area. Meetings, events, and initiations are conducted here. Each day, in the late afternoon, Maa gives Darshan to all in the camp and many others who come from all over the Kumbh Mela campground for Maa’s Darshan. The sacred fire ceremonies (yagyas) conducted during the Kumbh Mela, under Sai Maa’s direction, are life-transforming events. 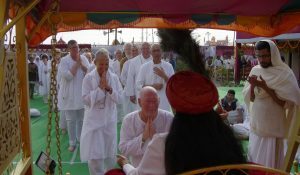 Each yagya contains a specific set of formulas for the release of precise energies for the participants and the world. 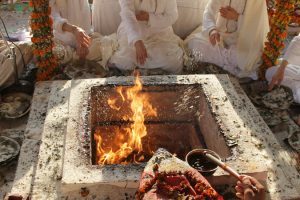 I can tell you from my own experience that a yagya can foster a magical occurrence that confounds the mind. One afternoon during the Kumbh Mela, I was sitting with my group around the yagya fire chanting my “swahas” and making offerings to the fire. The heat was intense and I felt my resistance mounting. The fire continued to grow higher and hotter. I felt trapped until a thought came to me… just let go, surrender to the fire, if I burn up so be it. Then it got hotter still. Yet, without any resistance on my part, the heat passed through me. And I could feel, I actually felt, that the heat of the fire was burning up impurities throughout my physical body, from the subtle to the gross. The feeling of having been cleansed, of being purified so deeply, remains with me today. Imagine yourself on the northern bank of the mighty Yamuna river where it joins and becomes the Ganga at Allahabad’s vast Kumbh Mela camp. At this point the river is over a half mile wide. To your left the Ganges bisects the camp accepting the Yamuna into its powerful stream on its way to The Bay of Bengal, some 700 miles to the east. To your right, up the river a half mile, and on the top of a nearby hill overlooking the river, sits the 16th century Allahabad Fort. Underground, where it merges with the Ganges, flows the mystical and sacred Saraswati river. You are standing at the site of the main bathing area of the Kumbh Mela, the confluence of these 3 major rivers. My last morning at the Kumbh Mela, I had walked alone the mile or so from Sai Maa’s camp to this very site to take my last bath. It was a glorious morning, sunny and warm. The water at the river was cool and bracing. There were a number of children gathered around as I waded out of the river and picked up my towel. They were laughing and talking and asking me questions, “Do you like India?” “What do you think of the Kumbh Mela?” “Do you like wearing a kurta?” I laughed with them and answered their questions. It was a joyful ending to my inner journey. Forget words, forget concepts and past patterns. Just let yourself be carried along with the current of the Kumbh Mela—for an incredible current it is. Will the Kumbh Mela transform you? Yes, to the extent that you allow.